Part of the 22nd Founding in M36, the Hawks of the Emperor were formed to curb a large Eldar incursion force into the Ornithius sector, Ultima Segmentum +++See archive #M.36.0014055+++. The Hawks repelled the alien invaders despite no further reinforcements from the Imperium and suffered great losses. Losing the war and numbers dwindling, Chapter Master Condorius and what was left of the 'Hawks Talon' Terminator company teleported onto the eldar flagship and engaged the crew in a bloody and brutal tunnel war. Farseer Lilien was defeated in personal combat by Brother Sergeant Kanati but Master Condorius was found slain aside along with five of his squad mates and the bodies of 42 Howling Banshee aspect warriors he had single-handedly bested in combat. With the defeat of their leader, the Eldar force retreated from the sector. The hawks had won, but at the cost of hundreds of men. Following the Ornithius campaign, the Hawks took up residence on Aviar, a volcanic jungle world in the primary system of Ornithar, and gaining the nickname 'Phoenix Hawks' to symbolize their rebirth like the mythical bird of terran legend. Being the only Imperial forces in the area, the Hawks became extremely proficient at fighting in all environments and once rebuilding of the chapter was started, the new Brother-Master Kanati ordered a new organisational model to be adopted. Each company was distinguished by a defining colour scheme on their uniforms and armour designed to camouflage in a particular environment. Each company contained Tactical, Devastator and Assault Squads and could be dispatched as independent fighting entities to fit any battlefield. The first and second companies however retained the chapter's original red and gold colourings. Whilst not adhering directly to the Index Astartes, the Phoenix Hawks remain devoted to traditional practices and are suspicious of those chapters who vary strongly from the teachings of Guilleman. During Abaddon's 13th Black Crusade, the Hawks sent 2 battle companies to assist Cadia. Joining the loose coalition of independant marine chapters known as the United Chapters Crusade (UCC), the Hawks were assigned to defend the Scelus system and soon found themselves pitted against Chaos forces and Necron raiders alike. As the campaign wore on the Hawks second company became heavily entrenched in Scelus but resolutely held their own against wave after wave of renegade marines. Following the end of the campaign and a glorious victory for the UCC in Scelus, most of the units returned to the homeworld for reassignment. During the Eye of Terror campaign, the second company defended the Scelus system against a Slaneeshi Cult. After the Cults escape in the closing moments of the Campaign, the Hawks pursued them to the Vulpeca sector in an effort to reclaim their honour and purge the heretics in the righteous flame of the Emperor. The cult was all but wiped out in a massive ciftyfight on the cathedral world of Vulpeca II, however when picking through the wreckage, the second company could find no trace of the cult's mysterious leader and - more disturbingly - subsequent glyph-analysis of data-shards recovered from their bunker database indicated armament supplies and links to the renegade Marines Ascendant chapter. The Hawks were involved in early fighting during the Medusa V incident. The majority of the Chapter being on search and destroy assignments against Hive Fleet Antona tracked a large splinter arm heading directly towards Medusa V.
The Phoenix Hawks have long harboured a strong resentment for the Space Wolves since the Lammas campaign when both Chapters were dispatched to aid a beleaguered Ultramarines force. The Space Wolves however, instead of co-ordinating the attack, provided false information and arrived first, destroying all opposition before the Phoenix Hawks respond. No Phoenix Hawk will ever fight side by side with a Space Wolf and small skirmishes have even been known to break out between the two chapters. The Hawks Fortress monastery is located high above the jungle roof on a massive Tor of rock known as 'The Giants Seat'. This makes the frotress extremely defensible, the only major entrance from the jungle being a long series of steps from the jungle floor to the base of the tor. It is said that the first trial a new recruit must face is the three-day trek unaided and unfed from the jungle to the top of these great stairs. The top of the seat houses the Hawks magnificent pyramid-fortress, half as tall as the giants seat again. It is surrounded by a bustling industrialised support network of landing pads, storage hangers, generators and censorium buildings. For a new recruit clearing the top of the stairs, this is such a sight to behold that one momentarily forgets his knawing hunger and dehydration, simply staring in awe. The Hawks recruit from multiple sources, but the majority of their neophytes come from the local indigenous population. These are a superstitious people who make their lives hunting the wild and deadly animals of the jungle for food. 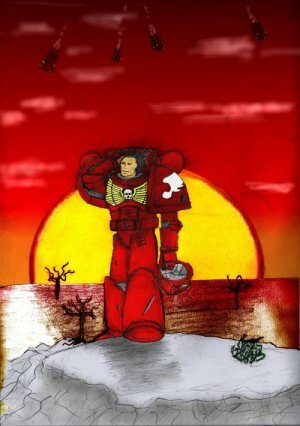 They tend to regard the space marines with awe, seeing them as godlike figures and treating them with respect and fear in equal measures. Every so often, a brave or curious hunter will depart his hut-village and desire to see for himself what lies atop the great stairs. This will be a difficult time for the young hunter, many such natives do not make the grade, and the stairs are littered with the corpses and skeletons of previous attempts. If he successfully reaches the top he is welcomed as a recruit into the chapter, having displayed the courage and strength of mind required to start his journey as a marine.